The St. Louis Cardinals visit Wrigley Field on Saturday, July 22, 2017 to play the Chicago Cubs. The probable starters are Adam Wainwright for the Cardinals and Jon Lester for the Cubs. The opening line for this matchup has St. Louis at +156 and Chicago at -166. The Cardinals have a 49-42-4 over/under record and a 43-52-0 run line mark. The Cubs are 38-56-0 against the run line and have a 45-47-2 over/under record. The Cardinals have a 46-49 overall record this season. Starting pitcher Adam Wainwright has a 11-5 record with an earned run average of 5.08 and a WHIP of 1.49. He has 92 strikeouts over his 102.2 innings pitched and he's given up 118 hits. He allows 10.3 hits per 9 innings and he has a FIP of 4.03. The bullpen has an earned run average of 4.06 and they have given up 295 base hits on the year. Teams are hitting .250 against the bullpen and they've struck out 293 hitters and walked 109 batters. As a team, St. Louis allows 8.6 hits per nine innings while striking out 8.3 batters per nine innings. They are 5th in the league in team earned run average at 3.88. The Cardinals pitchers collectively have given up 816 base hits and 370 earned runs. They have allowed 107 home runs this season, ranking them 25th in the league. St. Louis as a pitching staff has walked 291 batters and struck out 792. They have walked 3.1 men per 9 innings while striking out 8.3 per 9. They have a team WHIP of 1.29 and their FIP as a unit is 4.06. As a team St. Louis is hitting .255, good for 17th in the league. The Cardinals hold a .420 team slugging percentage and an on-base percentage of .328, which is good for 11th in baseball. They rank 17th in MLB with 8.7 hits per game. Matt Carpenter is hitting .249 with an on-base percentage of .383. He has 78 hits this season in 313 at bats with 45 runs batted in. He has a slugging percentage of .454 and an OPS+ of 120. Jedd Gyorko is hitting .290 this year and he has an on-base percentage of .350. He has totaled 86 hits and he has driven in 49 men in 297 at bats. His OPS+ is 120 while his slugging percentage is at .498. The Cardinals have 823 hits, including 171 doubles and 112 home runs. St. Louis has walked 327 times so far this season and they have struck out 771 times as a unit. They have left 647 men on base and have a team OPS of .747. They score 4.49 runs per contest and have scored a total of 427 runs this year. Chicago has a 49-45 overall mark this year. With an earned run average of 4.07, Jon Lester has a 6-6 record and a 1.30 WHIP. He has 116 strikeouts over the 115 innings he's pitched. He's also given up 111 hits. He allows 8.7 hits per nine innings and his FIP stands at 3.83. The bullpen has an earned run average of 3.30 and they have given up 260 base hits on the year. Teams are hitting .214 against the Cubs bullpen. Their relievers have struck out 359 batters and walked 144 opposing hitters. As a team, Chicago allows 8.1 hits per nine innings while striking out 8.7 batters per nine innings. They are 8th in the league in team earned run average at 4.01. 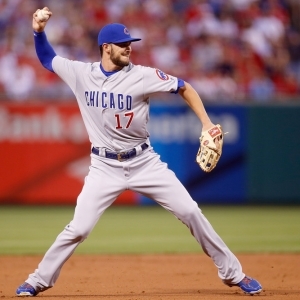 The Cubs pitchers as a team have surrendered 754 base knocks and 374 earned runs this season. They have given up 111 home runs this year, which ranks 20th in Major League Baseball. Chicago as a staff has walked 327 hitters and struck out 812 batters. They give up a walk 3.5 times per 9 innings while they strike out 8.7 per 9. Their team WHIP is 1.29 while their FIP as a staff is 4.22. As a team, they are batting .245, good for 23rd in the league. The Cubs hold a .432 team slugging percentage and an on-base percentage of .329, which is good for 10th in baseball. They rank 25th in MLB with 8.3 hits per contest. Javier Baez comes into this matchup batting .275 with an OBP of .312. He has 72 hits this year along with 39 RBI in 262 AB's. He maintains a slugging percentage of .485 with an OPS+ of 104. Anthony Rizzo is hitting .254 this season and he has an OBP of .378. He has collected 87 hits in 343 at bats while driving in 60 runs. He has an OPS+ of 130 and a slugging percentage of .510. The Cubs as a unit have 777 base hits, including 163 doubles and 133 homers. Chicago has walked 357 times this year and they have struck out on 789 occasions. They have had 655 men left on base and have an OPS of .761. They have scored 4.71 runs per game and totaled 443 runs this season.